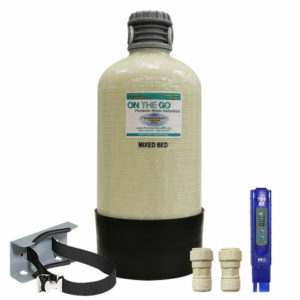 Hard water is found in many areas of the country. The hard water available at some RV parks can cause plenty of ill effects to your RV. These can range from soap scum that doesn’t rinse off to calcium deposits on dishware to damage to your plumbing fixtures. 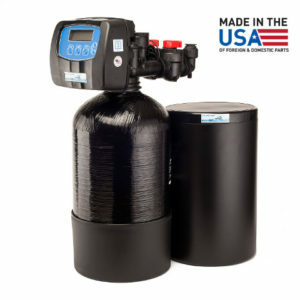 To rectify this you need a water softener. A second concern is how to wash a large motorcoach without leaving water spots on the finish. Even soft water will still contain some mineral deposits and when you rinse off your coach the water will dry and evaporate but the mineral content of the water will remain and leave water spots on your painted coach finish. To eliminate these unsightly water spots a deionizer is used. Add a DI to your Road Wave system for that spot-free finish. Deionizers are different than softeners. 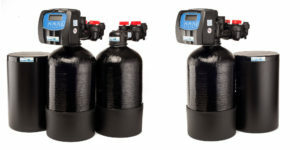 Deionized water is simply water that has all of the ions removed from it. 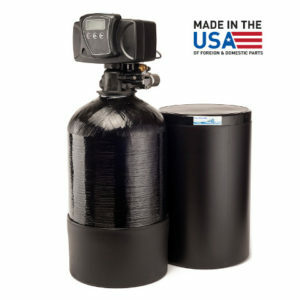 Deionizers replace the positively charged calcium, magnesium, iron and sodium ions (cations) and negatively charged chloride, sulfate, nitrate and carbonate ions (anions) with hydrogen (H+) and Hydroxyl (H-) ions which combine to make pure water that won’t leave any water spots when dry. 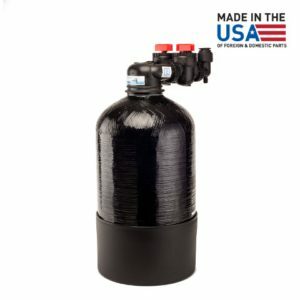 The Fleck valve (all USA made) comes with a 5yr parts warranty on the valve, all USA made resin, stainless steel bypass, (not plastic) and the flow meter that lets you know how much water you have used, for the automatic regeneration cycle to come on. (Others may charge for the stainless steel bypass and the flow meter). The system comes with reducing couplings (if needed) for 3/4″ to 1/2″, so all you have to do is install to your in-coming 1/2″ coach water line and install the drain line to your gray tank. The DI system (all USA made) comes with a resin made by Purolite, all USA made resin highest quality level of resin for a mixed-bed resin. (Not from China). The DI system comes with a bypass pass valve (not an add on cost). 5yr parts warranty on the in and out valve. The DI system comes with a reducing coupling ( if needed) for 3/4″ to 1/2″.